Preserving Family Memories is our library’s bi-annual event hosted during Preservation Week (April) as well as National Save Your Photos Month (September) or Family History Month (October). Like most of my favorite programs and events, this digitization series came about when a patron suggested it and offered to volunteer. It was January, and I had a book display celebrating Get Organized Month (from the National Association of Professional Organizers). A regular patron was checking out the display and mentioned to me that she has her own digital organizing company, and asked if we could speak about putting together an educational presentation. Before my current position in a public library I worked in preservation, so I have a deep love for archival material and history in general. Naturally, I was intrigued by the patron’s suggestion and set up an appointment right away. Diana Uricchio is CEO of OXO Digital Organizing and primarily works with families in their homes to create a system to digitize, find, preserve and share photos and documents. When we first met to talk about a program like this, she explained that many of her clients are faced with a mountain of media to sort through, often following a death in the family. Items such as old photograph albums, 8mm video, undeveloped 35mm film and other obsolete media can easily become a burden for a grieving family to manage. Today’s families want to have instant access to these photos and documents and be able to share them across a variety of media. They also face a new media migration issue: what should we do with all of our born-digital media? Digital organization is an ongoing responsibility and is constantly evolving, as librarians well know. This makes the library a perfect place for a program such as Preserving Family Memories. I scheduled the first event to take place during Preservation Week, and on a weekend afternoon, making it ideal for working adults and retired people. Diana and I both knew that offering free scanning at the event would be a great accompaniment to the presentation. The library currently doesn’t have any scanning services outside of traditional printers, so she contacted a colleague of hers, Rick Lippert of EZ Photo Scan, a professional photo scanning group. Rick brought his equipment, technical expertise and many years of digitization experience to the team. EZ Photo Scan had professional-grade equipment that made scanning fragile materials easy, which was ideal for our event. I made a cute graphic and started promotion about two months prior to the program. Diana and Rick also shared the graphic and marketed the event. Patrons were asked to register online and were encouraged to bring up to 100 photos and documents for free digitization. The afternoon of the program, Diana and Rick arrived early with a scanning assistant, who set up the equipment in the back of the room. There were two scanners: one flatbed and one high-speed photo scanner, as well as two small laptops. When attendees first arrived, they gave their albums and materials to Rick and his assistant, who quickly scanned their items and uploaded them to a secure file host. Attendees then received an email with a unique link to access their digitized materials for 120 days. I made some tea for our attendees and after scanning was complete, they sat down for a PowerPoint presentation on basic preservation concepts for family photos and documents, including where and how to store fragile material. About 20 patrons attended this presentation, which is a good number for us. Because my presenters donated their time and services for these events, the library was able to host this program free of cost. Rick and Diana are local entrepreneurs who use and value their library and benefitted from the opportunity to educate patrons and talk about what they do. Library policy does not allow business partners to directly solicit patrons, but partners are encouraged to bring fliers and talk about their services. Most businesses I’ve worked with are keenly aware of the benefits of supporting their local library and are happy to bring their expertise at no cost. This program model and series has worked well for our library, and I believe can easily be adapted to a variety of library types, depending on your partnerships. 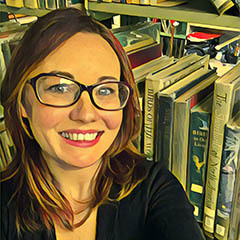 While organization books and tips continue to trend, there are many opportunities to teach digital preservation techniques in the library setting. Use what you have! Many libraries already have photo scanners, slide/film scanner, etc. Make an event out of using them! Get your colleagues involved. I encourage library staff to bring in items they may need scanned, or ask them to play a role in the event, no matter how small. Everyone is more likely to talk about and help promote a program if they feel included and invested. Create a great promotional graphic. Include your partners’ logos on an eye-catching graphic. There are so many free graphic design tools out there, but Canva offers a free upgrade for nonprofits.